A restaurant that welcomed the literati, community organizations, and smokers. Source: the Globe, February 26, 1926. For over two decades, the Brown Betty Tea Rooms offered a comfortable space for Torontonians to meet, dine, and talk—and served as a meeting place for groups such as suffragettes, labour associations, political parties, arts clubs, and dancers. Opened in February 1908 by three cousins who’d trained as nurses at prestigious schools such as Johns Hopkins, it grew from three small rooms and a tiny kitchen into a complex occupying three floors of 42 King Street East. From the start, its cozy decor and spacious surroundings attracted organizations such as the Heliconian Club, which was on the hunt for lecture space. 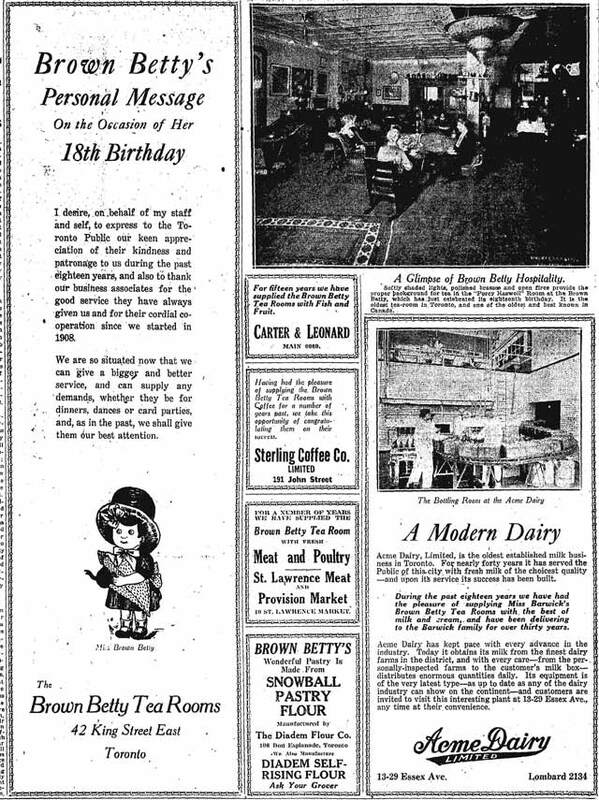 Staff may have also appreciated the atmosphere—during 18th-anniversary celebrations in 1926, it was noted that many waitresses had worked there for more than a decade, while the chef had been there since day one. 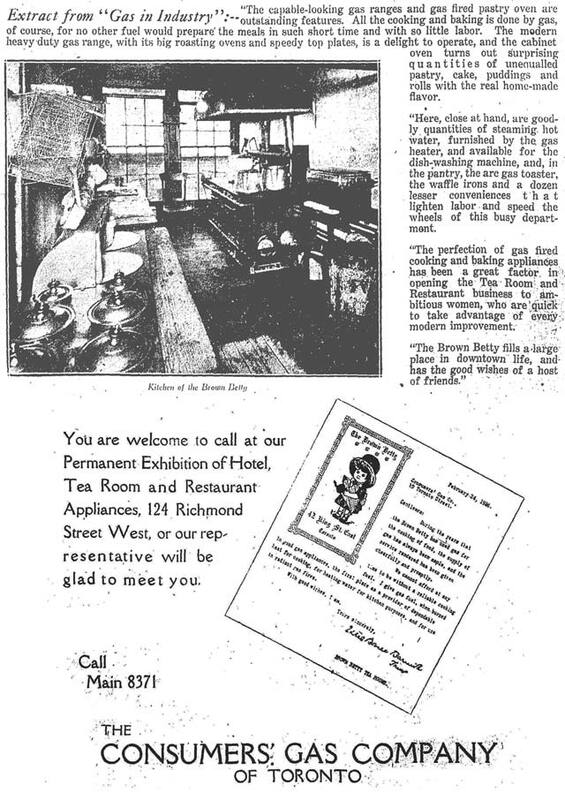 Source: the Globe (left) January 22, 1924; (middle) March 1, 1924; (right) March 21, 1924. Whether we are conscious of it or not, it seems that we, most of us, possess the artistic sense which can here be gratified. Pleasant surroundings undoubtedly tend to promote that good digestion which should “wait on appetite.” Upstairs there is a “General” Room, and a room where mere man holds full sway, with more easy chairs and gas fires to minister to his comfort; and still another, the “Yellow Room” so that everyone may suit his passing whim. Visitors gravitate naturally toward the little tables set with Brown Betty ware, flower-decorated and tended by waitresses who move swiftly to and from the serving pantries and the kitchen where lies concealed the machinery of Brown Betty popularity. The city’s literati held court at the Brown Betty. The Canadian Authors’ Association held its annual dinner there during the late 1920s, and the Toronto Writers Club booked a private room for its functions. Participants discussed questions of culture, taste, and professional development. During a 1924 Writers Club session, for example, American drama critic Clayton Hamilton offered the following not-altogether-startling advice to budding playwrights: “Nowadays a play is an immediate success or an immediate failure. There is no royal road to success. The play must be good. If not, neither public nor manager wants it.” At a 1928 dinner, Globe sportswriter Austin Cross urged Canadian writers to lighten up and embrace humour in their work. Press clippings reveal that attendees also engaged in discussions of other issues that remain relevant to writers today, including federal copyright law and new forms of journalism. Fire struck the site twice. An April 1927 blaze resulted primarily in damage to a top-floor kitchen, but a second fire in January 1931 may have had long-term consequences—from that point on, references to Miss Brown Betty and the tea rooms vanished from the local media. Additional material from the September 11, 1925 edition of the Canadian Jewish Review; the May 28, 1924, December 6, 1924, February 26, 1926, and May 28, 1928 editions of the Globe; and the December 1919 edition of The Lamps.